We continue our reread with chapters 11-15 of Harry Potter and the Chamber of Secrets, wherein Harry encounters his first example of a patently evil book that he trusts implicitly over the advice of his loved ones and the adults entrusted with his protection. Harry’s not the best at learning from his mistakes, is what I’m getting at here. 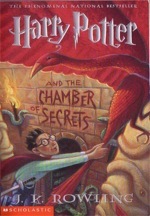 Comment here on chapters 6-10 of Harry Potter and the Chamber of Secrets, wherein Harry starts hearing a disturbing voice threatening to murder people, but doesn’t see any reason that might be important to report to an authority figure. The Great Harry Potter Reread continues with chapters 1-5 of Harry Potter and the Chamber of Secrets, in which Harry meets Dobby, goes to Ron’s house, and returns to Hogwarts in, er, triumph.